Known for it's extravagant look and unique features, Top Game software has made a splash in the online casino industry. These casinos offer the best in graphics, sounds, and game selection. Top Game casinos are open to players across the world, including the US. Top Game software has been around for many years, though it wasn't until 2008 that they burst onto the online gambling scene. Upon their inception, rather than offering their services to existing online casinos, Top Game decided to release their software in a line of brand new casinos, starting with Rome Casino. Despite being a relatively new software provider, they have already earned a reputation for providing an unbeatable product. The look and feel of their games, particularly the online slots, won't be found in any other software. The themes are imaginative, the graphics are crisp, and the selection is nearly endless. They offer up such titles as Slotstructor, Fantasy Nuts, and Diamonds are Forever. Plus, there is an extensive list of progressive online slots to choose from. Check out the Top Game software by visiting Rome Casino �' our favorite Top Game casino. Aztec Casino was established in 2008 and has developed into a fantastic online casino. They're offering an excellent selection of games, which includes roulette, Blackjack, Video Poker, and, plenty of slots! 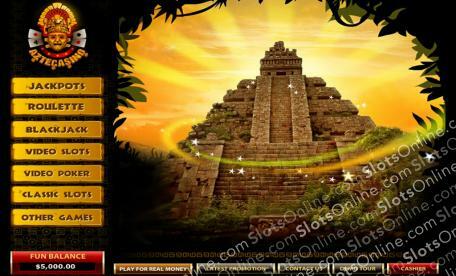 Download the free software to experience the fun of Aztec Casino. Read our review, and then be sent back in time to an exciting online casino experience at Rome Casino. You can download the software and be playing for massive cash jackpots, or simply for fun, in no time at all.